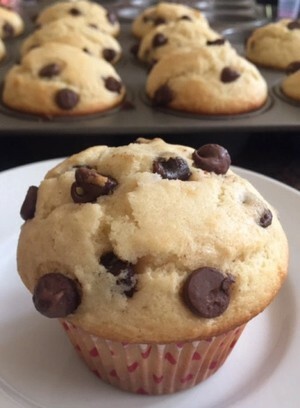 The secret to these moist, tasty muffins is the buttermilk! You can use whole or regular milk, but these babies texture and taste are best when the buttermilk is used. And since we all are chocolate lovers in this house, I don’t skimp and use the mini chocolate chips. But if you are not into eating dessert first thing in the morning, the mini chips may be a good idea for you.